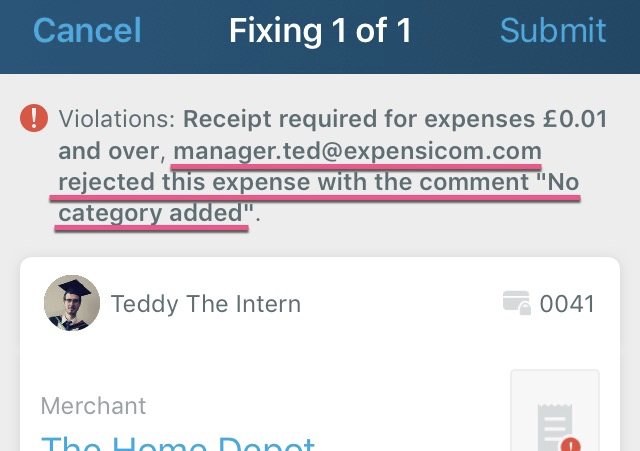 In the mobile application, how can an employee tell that an expense was rejected and why/what is needed before resubmitting? When I look in the app at an expense that the approver rejected, it only appears as Open and I can't see anywhere how I would see that it was rejected or why. 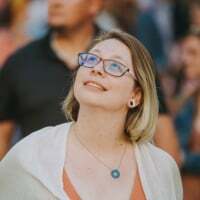 @acaso I took a look at that expense and I see that the entire report was rejected. We only notate the expense if a single expense is rejected on a report. Let me know if you have any questions! Thanks for your response. I believe the message you show in this screen shot is due to a policy violation. Yes, I do see that they show up on the expense in the mobile app. However, what I'm asking is how I can see that an expense was rejected by the approver and why. 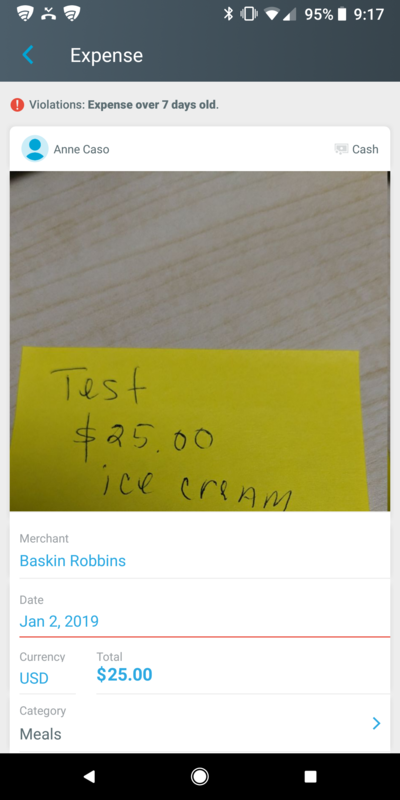 Attached is a screen shot from the mobile app of one such test expense. It does show a violation that it is over 7 days old, but it doesn't indicate the approver rejected it and why (it wasn't because it was over 7 days old. 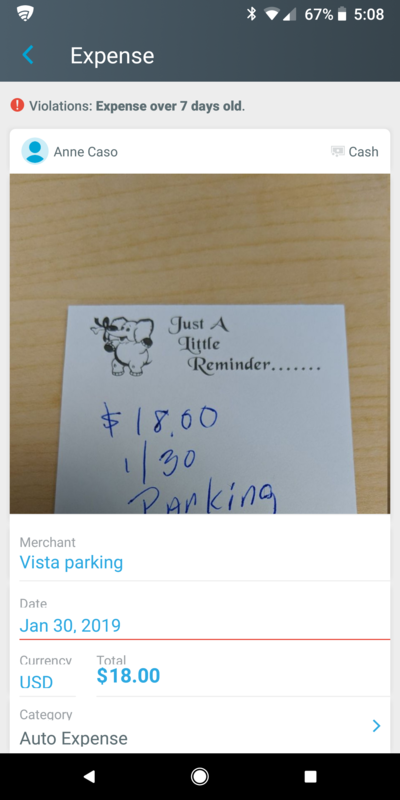 In the web browser version (second screen snip) I can see in the history that it was rejected and that the approver indicated "provide names of guys" and I can't see this in the mobile app. This is how it will appear in the mobile app. Thank you for your patience Ted. I created a new expense and had the approver reject it (one that wasn't over 7 days old) and I went into that expense on the mobile app and saw a very small red dot and when I tapped it, the rejected messages started appearing at the top of the expense entry page when I tapped into them. A follow-up question on this: If there is more than one violation (for example the expense for the $25 ice cream in my initial screen shots), should it show both violations so that I would see the approver's reason for rejection. 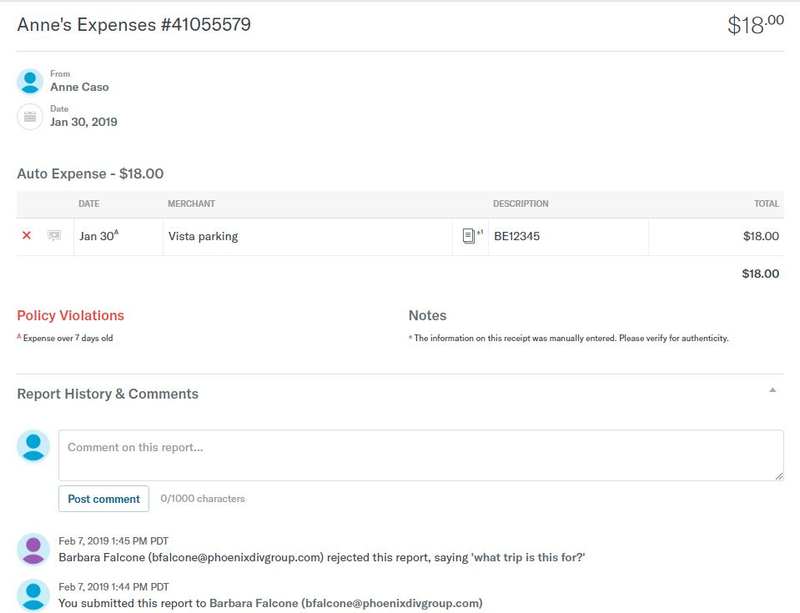 On that $25 expense, I only see the expense over 7 days old violation and don't see the approver's rejection note of "need names of people this was for" - I can only see that note in the browser version in the history of the expense. sorry Ted, I hit post too soon. I wanted to point out that from your screen shot, it looks like you have exactly that example shown. Where there was a violation and an approver rejected it with a comment. Is there somewhere I need to check a setting to make this work properly? @acaso, can you confirm if the expense that was rejected was your own? I have been testing the behavior and haven't been able to recreate what you're seeing. Instead, I see the violation and the comment about why it was rejected. Yes, it is my own. 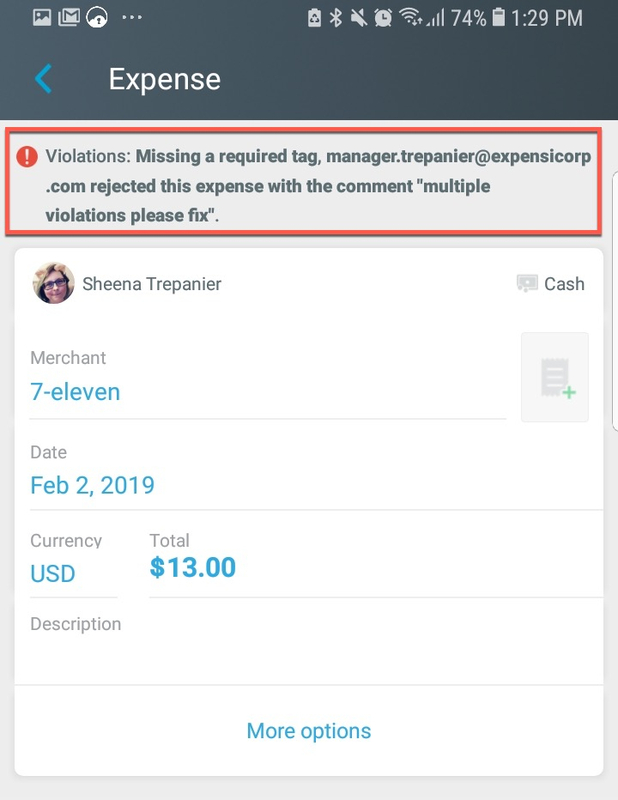 I am actually the only person submitting expenses as of today, I can see it in the app and can see the one violation, but can't see the comment the approver added when they rejected it. I tried adding another receipt that was more than 7 days old, submitted it and had the approver reject it with a comment. Again, I can only see the one violation, that it is more than 7 days old. I have attached what this looks like in the browser. In the app I only see the Violation that it is more than 7 days old. I submitted a current expense and had the approver reject it with a comment and on that one I can see the approver's comment. 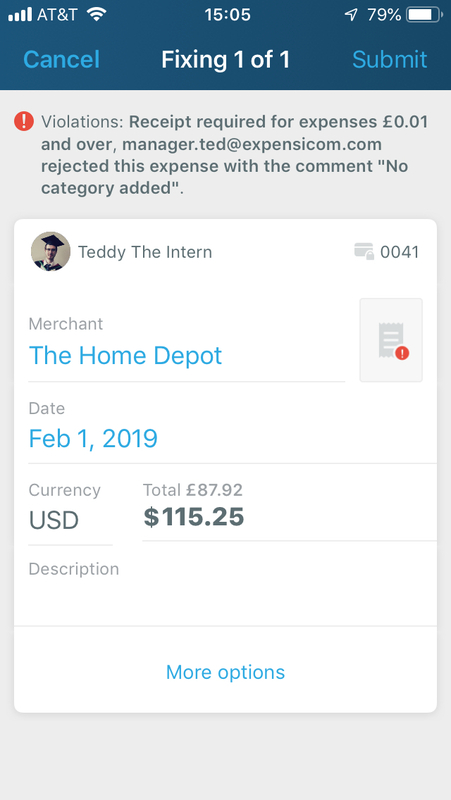 Can you send us a screenshot of what you are seeing in the app when you view the expense? I'm going to have another user run through this scenario today also, but it won't be until later today.